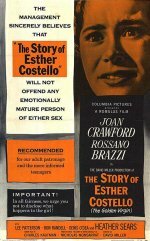 Melodrama in the grand Hollywood tradition as wealthy socialite Joan Crawford adopts an Irish girl (Heather Sears) who has lost her sight, speech and hearing as a result of an accident. Unfortunately, Crawford's estranged husband (Rossano Brazzi) turns her charitable deed into a shameless exploitation racket. Crawford adds high emotional gloss to a tailor-made role that successfully tugs the heartstrings and holds the interest.